Are you a gun addict or hunter who wants to turn your gun love into one collection? This is the reason why rifle gun safe stands here to help you overcome difficulties. 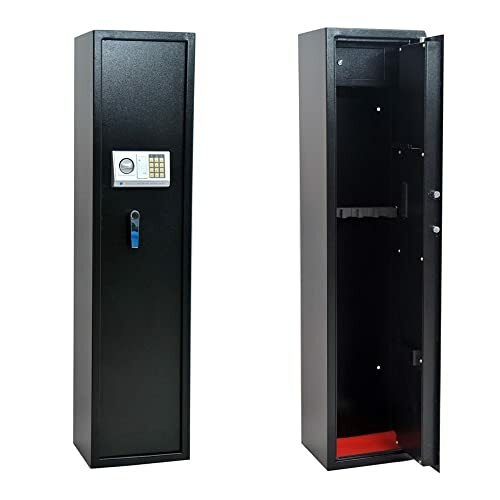 Among tons of purchasing options, Homegear Gun Safe Electronic 5 Rifle is successfully considered as an out-standing recommendation thanks to a great number of gorgeous features. It reaches main purpose in protecting your children from unacceptable permission. For the great performance, the tool deserves to rank 4 out of 5 stars. To be honest, this security cabinet hasn’t performed perfectly yet. However, we are telling you the reason why it is still one of the most favorite items on the market. The gun safe is very simple, but also classy on its first appearance. It measures 13.8 inches width, 11.8 inches depth and 57.1 inches height, actually not much bigger than other products in the same category. As a result, you will find it great to store the cabinet everywhere you want, even in small areas. The tool is surprisingly light-weight to carry without any difficulty. Homegear attempts to deliver a full package of supportive accessories in its products. There is no additional tool required for its establishment. Therefore, it takes users less than an hour to complete all necessary assembling steps. Differentiating from other traditional gun safe options, the model equips 4 AA batteries for its operation. Homegear Gun Safe Electronic 5 Rifle has been recognized as the safe way to store rifles and shotguns. Coming with the CE and RoHS Product Certification, it guarantees to bring the best product performance and customer service to users. A big plus of using the tool is that customers could take advantage of its design to store up to 5 rifles or shotguns. Equipping with a separate lockbox at the top of the safe, it provides an ideal place to keep valuable items such as jewelry. How multi-functional the cabinet is! Safety is a vital element which encourages customers to invest in a rifle gun safe. Homegear Gun Safe makes impressive by solid design from top high-end materials. All parts of the tool are covered by durable materials which enhance the long-lasting usability for years. Using the model means you have chance to enjoy the great safety from heavy duty steel construction with thick 4mm front door and 2mm walls. There are two options for you to open the cabinet door, including modern method of electronic keypad or manual keys. There are several important things you had better bear into your mind before purchasing a gun safe. Quality of the product should be put into the first consideration. Other factors could be listed here include budget, space for storage, or types of gun safes. These elements put positive impact on narrowing down your decisions and supporting you to select the most suitable models. Try to find out the best item which matches your requirements and budget the most. Without any doubt, Homegear Gun Safe 5 Rifle should be a necessary item for every home use. Although it is hard to protect your guns from professional thefts, it provides all basic features of protecting your children from accessing the cabinet use. All you need is ensuring that the product comes from well-known brands and meets your needs and demands well.